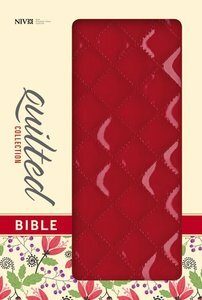 About "NIV Thinline Bible Quilted Cherry (Red Letter Edition)"
The NIV Quilted Collection Bible features a stylish, stitched binding. The cover, made with colorful Italian Duo-Tone material, has been stitched with a quilted pattern giving it a fresh and unique look. The stylish design along with the convenient size of this full-text Bible allows it to go just about anywhere.